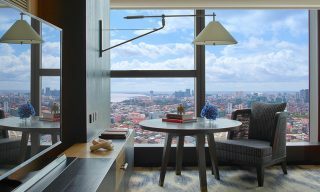 Currently in residence in Cambodia, 700,000 Heures provides not only one of the world’s most exclusive travel experiences, but also a whole new way of thinking about hotels. A breakfast nook at Puglia’s Palazzo Daniele, which hosted the first of 700,000 Heures’ nomadic hotels. Looking back, I’m still not entirely sure when it happened. Was it as we cut the boat’s motor and drifted into a grotto on water of such vivid hue and clarity that we might have been adrift on a sea of liquid emerald? Was it as we chanced upon the beautiful Renaissance heart of an unprepossessing village we’d only driven through as an afterthought? Or was it when we stopped on a quiet coastal road in the middle of nowhere and were led down to a rocky shelf a meter above the Mediterranean, where a pop-up lounge and cocktails were waiting for us to enjoy the sunset in splendid isolation? I can’t be certain. The only thing I know for sure is that at some point during my three days in Salento, I realized that I didn’t want to go home. 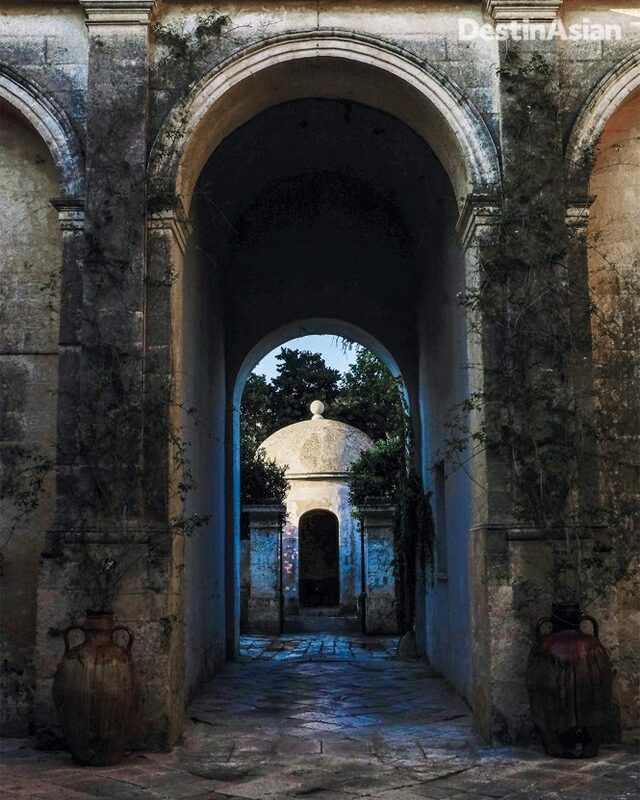 The less visited part of Puglia, right at the tip of Italy’s heel, Salento is a rolling landscape of rich red soil, cactus fences, swathes of bougainvillea, and acres of olives. It’s also studded with dammusi—low, circular stone granaries that wouldn’t look out of place in the Stone Age—and sleepy villages whose most prominent feature is the church tower. Visually, my first impression was that it looked like North Africa, particularly Tunisia’s Cap Serrat, except that here, the minarets had been replaced with steeples and the whitewashed, cubist medinas with maze-like medieval sandstone warrens. After living in Lebanon for 20 years, this quintessentially Mediterranean land felt very familiar to me. 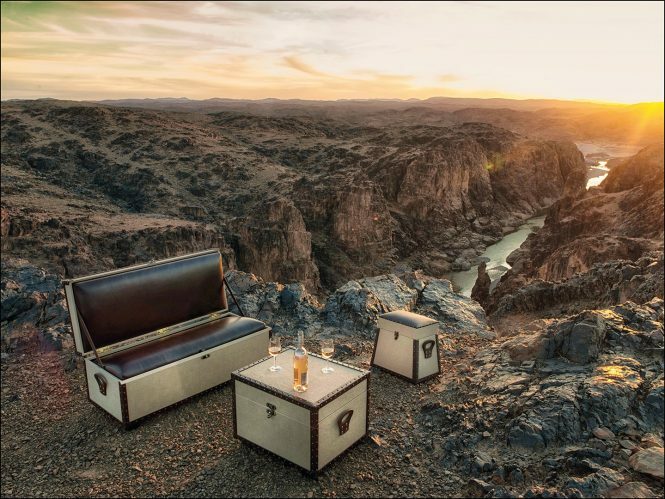 700,000 Heures’ bespoke trunks double as portable seats and cocktail bars. Still, nostalgia and unsullied charm were only part of the reason I suddenly found myself overwhelmed by an urge to stay. The rest had to do with the reason I was here—an invitation to experience what is billed as the world’s first “nomadic” hotel. More properly known as 700,000 Heures (the name refers to the number of hours in an average human life), it is the brainchild of the enfant terrible of French hospitality, Thierry Teyssier. 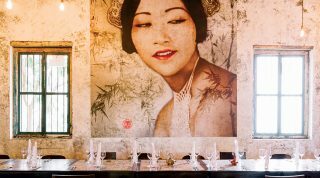 September’s Salento residency marked the venture’s soft launch, an opportunity to iron out the kinks before its move in November to a quartet of locations in northwestern Cambodia. Like many revolutionary ideas, the premise behind the project is both improbable and simple. 700,000 Heures will earn its nomadic stripes by changing location twice a year, and much like those global tech unicorns that provide services without owning physical infrastructure, it will be able to do so because Teyssier will run his temporary hotels out of existing properties that he rents exclusively—in Salento, this was the 19th-century Palazzo Daniele in the sleepy village of Gagliano del Capo—and will recruit staff locally for the duration. Where necessary, properties will be renovated and meticulously restyled, while staff will receive training at Teyssier’s acclaimed Moroccan hotel, Dar Ahlam, to ensure that service standards remain consistent. Then, after six months, the refreshed property is returned to its owners, staff are released with valuable training and experience, and 700,000 Heures moves on. All that will travel between sites are a collection of handmade leather-and-canvas steamer trunks. Apart from games and decorative knickknacks, these contain everything 700,000 Heures needs to be location-independent; beds, seats, kitchens, cocktail bars, even camp showers. This means, for example, that in addition to its rented properties, 700,000 Heures can set up on the beach, in the jungle, on top of a mountain—anywhere, really, that its founder desires. And that desire is key. At least for the first few years—after Cambodia, the hotel already has residencies planned for northeastern Brazil, Sri Lanka, and Japan—it is Teyssier who will both determine location and set the pace. Think of him as explorer and set designer, mediator and well informed “local,” who knows you well enough to suggest where to go shopping, where to eat, what sights you are most likely to enjoy, and what you can miss. In short, 700,000 Heures is Thierry’s World, but one we are welcome to live in. Maybe it’s also a chance to do nothing—to wander, to soak up, to be. 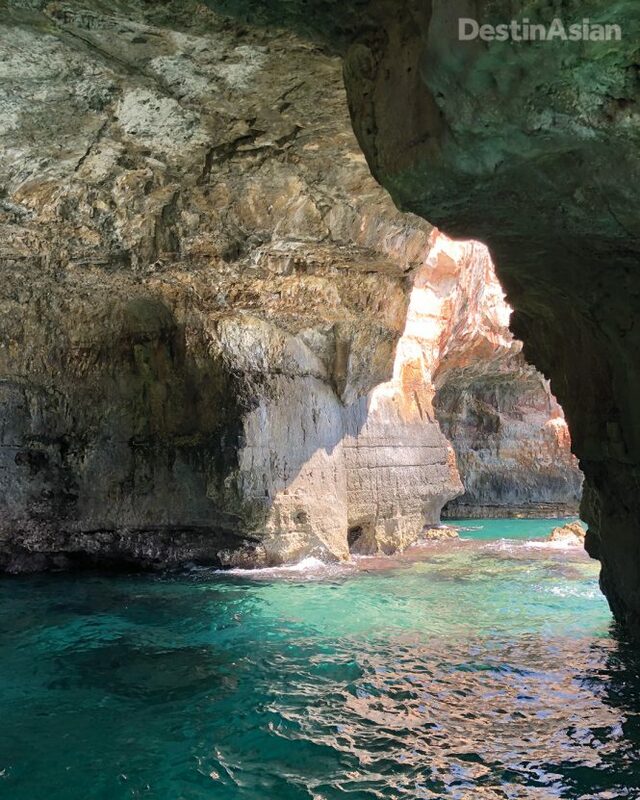 A grotto on the Salento coast. Take Cambodia, for example. As one drawn to off-the-track places, Teyssier initially wanted to steer clear of Angkor, feeling it was already oversaturated. But when Rosenfeld introduced him to the owner of one of the finest traditional Khmer wooden houses in Siem Reap, he reconsidered. 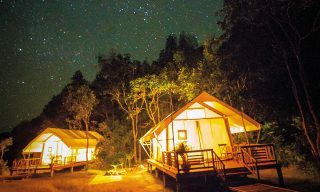 By adding to this a night in a pop-up camp near a remote Angkorian temple and another on a fisherman’s houseboat on Tonle Sap lake, he realized that it suddenly became possible to offer a unique experience. The founder of one of France’s top experiential events planning agencies, Teyssier first cut his hospitality teeth with Dar Ahlam, a restored 19th-century fortress in the Ouarzazate region of Morocco. Set amid almond trees and date palms on the edge of the Sahara Desert, the intimate 14-room hotel is meant to feel like a private home (the name means “house of dreams” in Arabic), with guest requests—everything from what to eat, to where to go, and what to do—arranged individually. 700,000 Heures is an attempt to take that formula on the road. 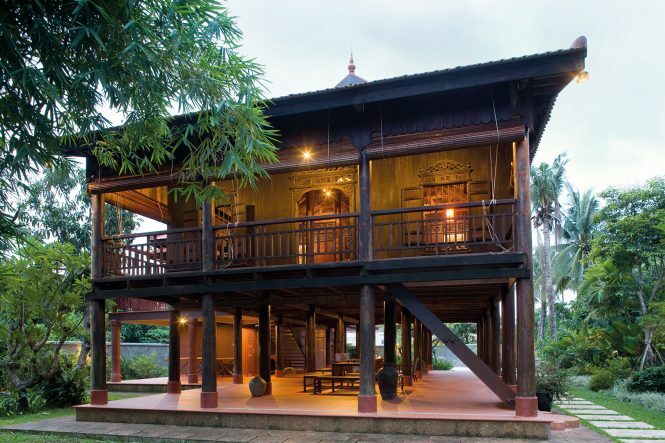 A masterpiece in wood, the century-old Hanchey House in Siem reap will host 700,000 Heures guests through April, as part of a six-night Cambodian itinerary that also includes stays in the heritage-rich city of Battambang and a houseboat on Tonle Sap lake. In Salento, this meant the freedom to follow an itinerary, create our own, or do a bit of both. So after our boat trip, which culminated in a lazy swim, we liberated Palazzo Daniele’s classic orange Fiat and motored off. Teyssier had recommended visiting Presicce, a charming town with lashings of architectural and historical character, several beautiful churches, a Baroque square, and a number of palazzi. Rarely visited, it felt like a genuine discovery, particularly when we learned that it also produced some of the finest gelato in the region. To allow Teyssier to conjure these curated stays from his magician’s hat of experiences, guests who he does not already know through Dar Ahlam are politely quizzed before arriving. This process begins upon one’s joining 700,000 Heures, for prospective guests must first become members of what amounts to a private club. A one-off entry fee, which starts at €2,000 (about US$2,300), is supplemented by an annual payment of €500. 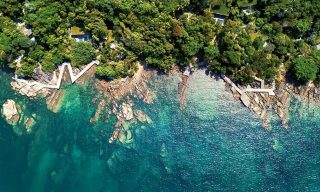 This secures access to the two yearly retreats and, depending on the tier of membership chosen, to an array of satellite events, ranging from dinner parties and private meetings with local artists, to accompanying Teyssier on scouting trips. 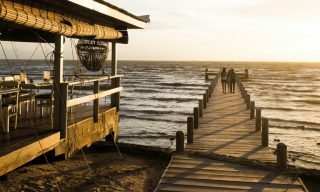 Stays then cost from €1,500 per couple per night and are generally six days long. 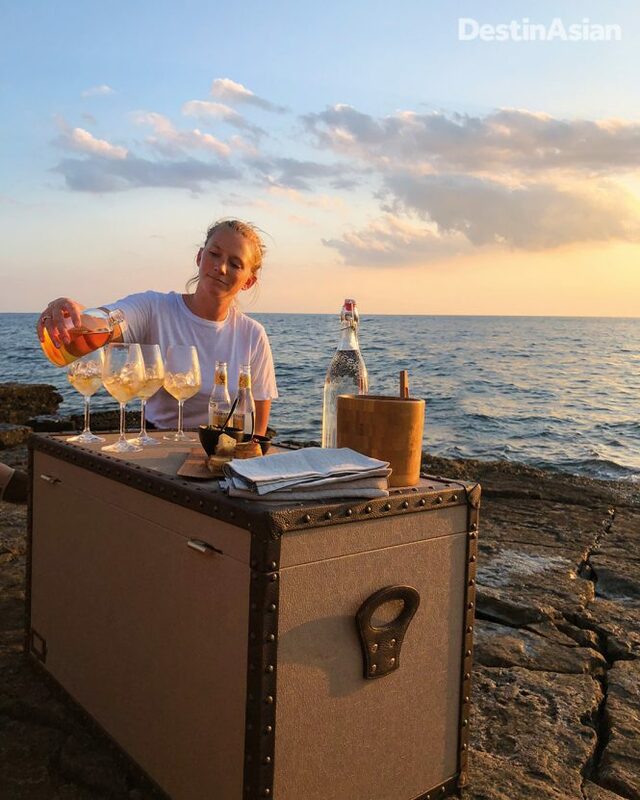 A 700,000 Heures staffer preparing sundowners at a pop-up cocktail bar on the Salento coast. This system has provided Teyssier with the funding to secure future locations—the first three years are already more or less mapped out—as well as to achieve a consistent level of experience. Overheads for a nomadic hotel may be minimal, but they are not nonexistent, especially if 700,000 Heures is to maintain a sense of effortlessness and ensure seamless transition between locations. The biggest advantage of being nomadic, however, may be the circumvention of what Teyssier calls “hospitality’s biggest problem.” By popping up in each locale at the best time of year, 700,000 Heures effectively eliminates a low season. Eventually, the plan is to have “ambassadors” in each country who are responsible for devising and testing the guest experiences, leaving Teyssier free to act as “artistic director.” For now, though, the venture is significantly more hands-on, a lot of work for a man who jokingly said that 700,000 Heures was basically “a way to have a holiday all year.” So what, I wonder, is in it for him? Following its inaugural September-October run in Puglia, Italy, 700,000 Heures put down stakes in northwestern Cambodia on November 25, where it will remain until April 30, 2019. Unlike its Salento tenure, the project’s Cambodian program encompasses not one but four accommodations with a six-night itinerary that includes stays in the historic Hanchey House in Siem Reap and a floating house on Tonle Sap lake, alongside two nights in Battambang and another camped out near a “hidden” Angkor temple where guests can participate in archaeological excavations. The all-inclusive experience is priced at €1,600 (about US$1,825) per night, doubles. This article originally appeared in the December 2018/January 2019 print issue of DestinAsian magazine (“The Finest Hours”).